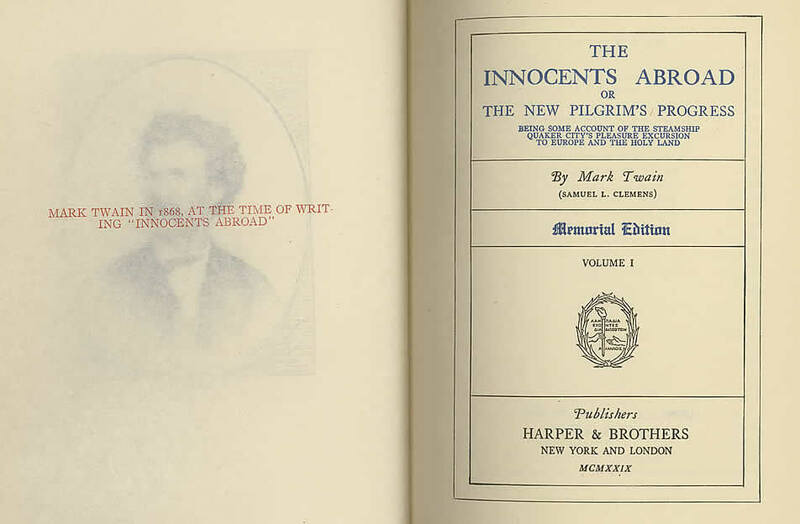 The Memorial Edition is one of two uniform editions of Mark Twain's works published under the Harper and Brothers imprint in 1929 -- the other being the Stormfield Edition. Printing codes for the volumes in the Memorial Edition indicate they were printed in September 1929 -- at the same time as the Stormfield Edition. 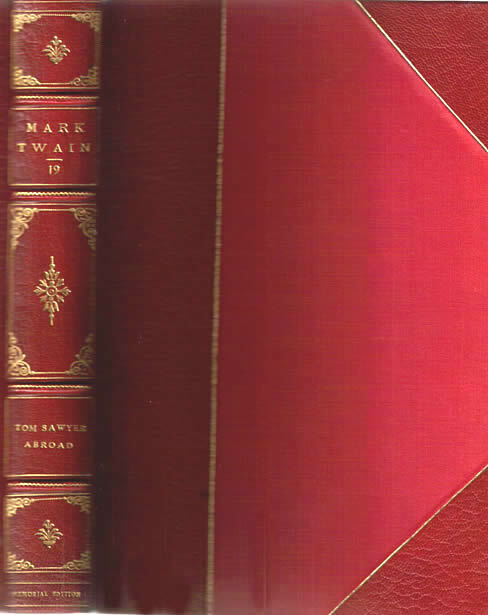 The Memorial Edition is the rarest of the uniform editions of Mark Twain's works. The set is identical in both text and illustrations to the 37-volume Stormfield Edition. However, the difference is that the edition was limited to 90 sets and each Volume 1 was bound with a page of original manuscript from Mark Twain's hand. 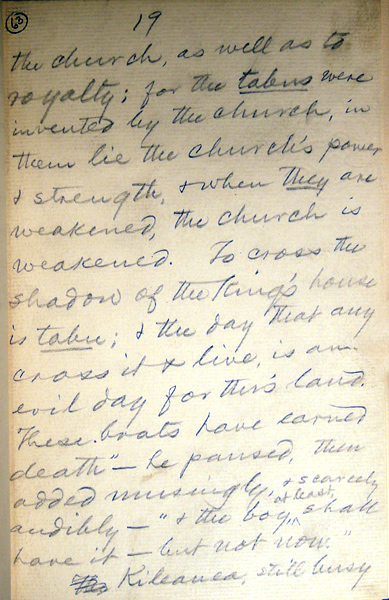 The pages of original manuscript that have been examined thus far (in September 2011) indicate the manuscript pages are from currently unpublished Mark Twain writings. Advertising and original pricing of the Memorial Edition is lacking. This scarcity of publicity surrounding the edition leads to speculation that the edition was issued by a special arrangement with one or more particular book dealers for private sales or distribution. Each set thus far examined has featured different leather bindings, indicating that each set was custom bound to a buyer's specifications. 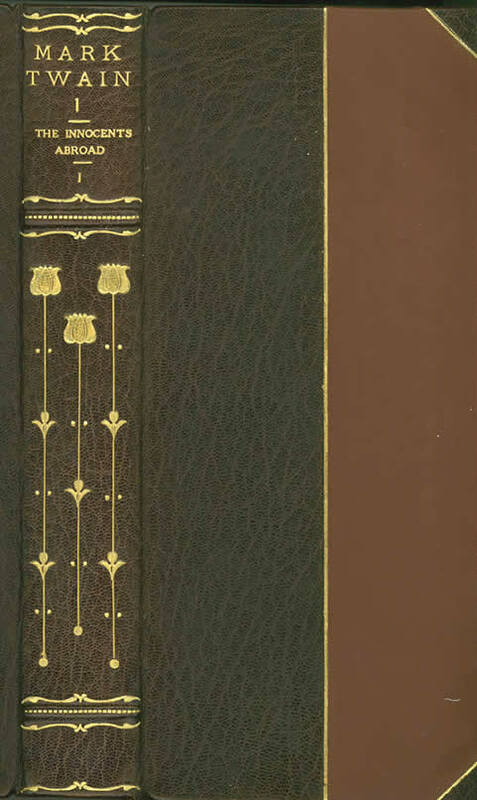 Most bindings are a combination of leather and cloth and feature marbled endpapers. In fact, no two sets examined have featured identical bindings. Top edges of pages are gilt and sides and bottom are deckled, indicating that same sheets were used for the Stormfield Edition. The Memorial Edition was limited in number to 90 sets. The limitation statement appears in Volume 1 and is hand numbered in red ink and features autograph script of Harper & Brothers. Photo of the Memorial Edition limitation statement is courtesy of the University of Oklahoma libraries. 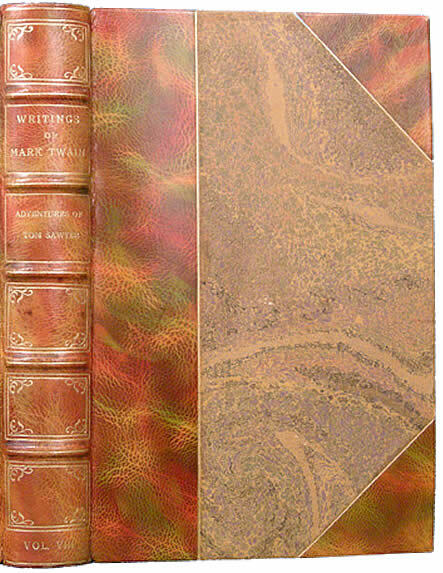 Binding manuscript pages into deluxe uniform editions of Mark Twain's works was a practice that had originated with the American Publishing Company's 1899 Autograph Edition when publisher Frank Bliss included manuscript pages from personal letters and the novel The Gilded Age in those sets. 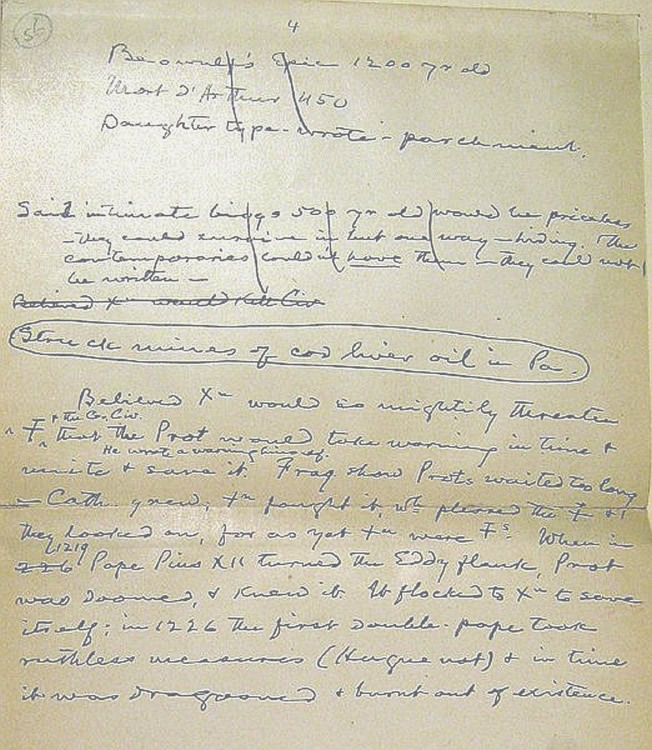 Manuscript pages bound into the Memorial Edition include leaves from an unpublished work on the Sandwich Islands that Clemens wrote in 1884. The source of the manuscript pages is unclear. Whether or not they were provided by the publisher Harper and Brothers, Mark Twain's daughter Clara Clemens, his literary executor Albert Bigelow Paine, or some other rare book and manuscript dealer remains undetermined. The circled number at the top left of the manuscript pages below are in unknown handwriting. The circled numbers indicate the set each manuscript page was destined for (i.e., set 68 features page 19 and set 74 features page 21 of Clemens's manuscript). These two manuscript pages are from an 1884 unpublished work on the Sandwich Islands. 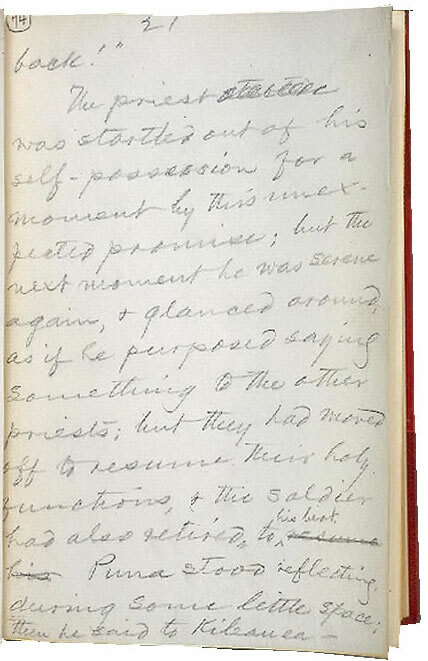 The manuscript page below may be from one of Clemens's personal notebooks. The scattering of unpublished manuscript pages via distribution with limited editions of Mark Twain's works makes recovery of those works almost impossible. The 37 volumes in the Memorial Edition feature the same illustrations that were also used in the Stormfield Edition. The textual content of the Memorial Edition is identical to that of the Gabriel Wells Definitive Edition. Volume 22, previously titled Literary Essays, is renamed In Defense of Harriet Shelley. The Memorial Edition, contains an autograph of "Harper & Brothers" and original Mark Twain manuscript material bound into Volume 1. 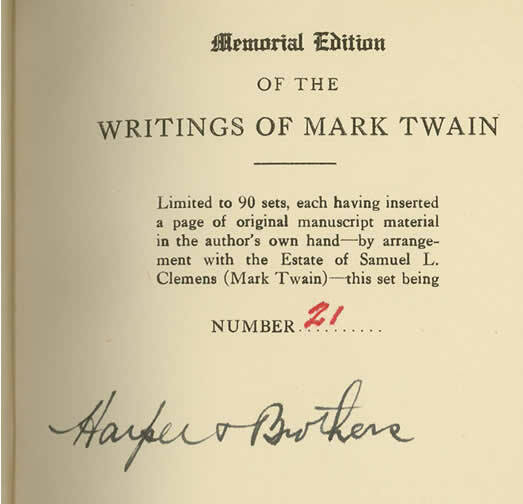 A Memorial Edition set which includes a page of original unpublished manuscript appears to rank higher in desirability among collectors than a set of the Gabriel Wells Definitive Edition containing only an autographed page from Mark Twain's hand. Salamo, Lin. Personal correspondence, 9 June 2009.